Using vintage video game sounds in rock music isn't necessarily a new concept, but it's safe to say few have done it as effectively or enthusiastically as up and coming Chicago band I Fight Dragons. The self-proclaimed "NES-rock band" recently released their debut EP, "Cool Is Just a Number," which matches Fountains of Wayne-esque sing-along rock with sound effects that will make you all nostalgic for the days when you rushed home from school to spend some quality time with your Nintendo Power Pad before dinner was ready. It would be easy for I Fight Dragons to sound like nothing more than a novelty act, but the band manages to keep their video game indulgences from dominating the basic elements of the songs. Instead, they use the sound effects to enhance well-written, extremely catchy material. If the 8-bit flourishes were stripped from "The Faster the Treadmill," for example, it would still be a power pop anthem worth shouting along to, while "Money" is a solid rocker that's given even more life with bubbly, synthetic NES blips skittering throughout. While the EP is worth checking out based on the songs alone, the band is as much of a visual act as one to listen to in the car, playing controllers, a Power Pad and other NES gear real-time during their gigs (check out this video to see how they do it). Even their MySpace page is more attention-grabbing than most, featuring 8-bit renditions of each band member and enough bright colors to make you feel like you've warped into Super Mario Bros. and should start stomping Goombas. With infectious tunes and no shortage of entertainment value, I Fight Dragons is a Windy City act that's bound to attract a lot of attention. 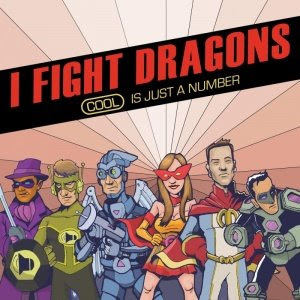 You can currently get a free digital download of "Cool Is Just a Number" by signing up for the I Fight Dragons mailing list here. You can also pick up a hard copy, or download it via iTunes. Catch the band live April 17 at Cubby Bear. I'm just going to have to disagree. The way they "integrate" the 8-bit sounds is hardly integration at all and often works like an entertaining commercial coming up between songs. With the exception of the acappella theme of Legend of Zelda, very few of their songs even seemed related to 8-bit games let alone "integrated". Their power rock drowns out the 8-bit sounds and reduces them to the melodic keyboarding prevalent in the 70s/80s. If you didn't know they were NES-related, you'd think it was keyboard/production and not necessarily 8-bit at all. You say, "If the 8-bit flourishes were stripped from "The Faster the Treadmill," for example, it would still be a power pop anthem worth shouting along to..." and I guess that's my problem. You shouldn't be able to take out the 8-bit sounds if they are "NES-rock". It's like when Third Eye Blind tried to claim they had "heavy hip-hop influence" and it was so obviously a PR gimmick. The NES is clearly a gimmick and not at all integral to their music. Then you have their lyrics and music... wow... that's just straight studio power pop. The lyrics could've been written for the score of a teen movie by Disney. The actual music could've been samples on Garage Band for the home music producer. I mean seriously, a "cynical" song about the evil of money? Jeez. What are we 14? Pedro The Lion did a whole album about the pitfalls of socio-political power dramas and here we have an adult band saying, "Money makes the world go round." Fountains of Wayne? Not even close. Yeah FoW used catchy hooks and power chords, but they also created intelligent indie-pop rock with grown-up lyrics and if they used a gimmick, you could tell what it was whether it was a sitar or samples. With over-produced and sterile pop like this, success isn't a question - they will do well. But will they be good? Like the vast majority of pop music, they'll disappear only to come up during a drunken bout of karaoke like Train, Vertical Horizon, Tonic, Better Than Ezra, et al. listen, just to be clear, all i'm trying to say is it is music not a movie or a book, the only way to judge music is by how well it is performed. Wow-that is way harsh and totally unwarranted. Are you saying in order to have an "integrated" sound all of the music must relate to the likes of Zelda and Mario? Ridiculous. They have a unique way to use these tools effectively to create a different sound. Obviously they put the effort into making these sounds work with their music. It's not like the put a Nintendo on the stage and pointed to it once in a while. They produced a show versus just getting up there and playing songs. They utilized a variety of media components to engage the crowd. And, for a young band, that is rather ambitious and I think they pulled it off well. So I'm just going to have to disagree with you. I Fight Dragons has a solid path in front of them. Jealous? I certainly wouldn't classify IFD as true "NES-core" or any such sub-genre. It's still very much competent pop in the vein of late '90s alt rock. What I would say is that they're a solid crossover act that incorporates chip-synth sounds without constraining itself within the nerd/game subject matter. And I think there's value in that. Value because it places the synth as a new instrument more on par with the other sounds of the act, instead of a central focus. Were they to obsess about NES-era games, I think it would come off as more of a gimmick. That said, I think the subject matter and lyrics have room to evolve and mature. While I do sometimes enjoy the humor and nerdy culture inhabited by nerdcore acts, I think a more appropriate direction would be to continue the lyrical conversations of Weezer, the Descendents, and Lucky Boys Confusion. These bands (and others) have a fair amount of songs on navigating life while still having nerdish tendencies and cultural artifacts. As for "Money Makes the World Go 'Round," I have a rather skewed view: My twitter/XBL handle is "E Munnie." I pull a reverse Carly Simon on that track. I LOVE I Fight Dragons, ever since they gave away their EP. A must listen for anyone who enjoys nerd rock, but it's so much more than that. When it comes to the world of chiptune or even nerdcore it's relatively apparent that even combined neither of you simply haven't the foggiest clue on earth what you're talking about. Perhaps instead of being so brash and entirely negative about a band that really does fit the chiptune scene quite nicely you should perhaps, spend your time finding chiptune that is located somewhere other than OCRemix. If you'd taken the time to do that beforehand you'd see your painful mistake. Not being much of a Blogger.com fan I'm unsure as to whether or not you are able to edit your own comments and perhaps rectify your mistake. Whichever the case allow me to educate and introduce you to the varied world of chiptune and it's many sub-genres. If you wanted pure chiptune you should perhaps start with someone like Jay Tholen or 8-Bit Betty. The mighty Mr Tholen only rarely uses direct sound effects that can be identifiable from whatever game they were originally taken. On the opposite side of that coin stands Betty who uses straight loops from the games. Maybe you're not into the game alteration stuff and you want music that sounds like it could have come straight from a game. In which case I would prescribe for some Philogiston or Animal Style or just about anything done by Evil Weezil. If none of the above seem to suit you I suggest you further expand and shift to nerdcore in which case I refer you to any of the Rhyme Torrent albums in which you'll see that not only do most of the songs have no straight game loops from them but that a growing majority of them hardly even involve any particular video or board game. However since you want that nostalgic feel from your music and you want verifiable proof that the music came from a video game I feel the need to recommend for you some MadHatter or Adventures of Duane & Brand0. As to the subject of their lyrics. This might come as a shock to you, but it's a long and glorious tradition to leave people with a thought that isn't completed as a means of expression. I Fight Dragons might actually want to just plant the thought in your head with an earwig lyric and let you puzzle the rest out for yourself. God forbid a band actually lets you decide something on your own. It might destroy the sheeple music community that currently controls the air waves. However I will concede that their lyrics, while still remaining pretty damn good, have room for growth. But seeing as this band is a mere six months old I'd say they're well on their way. By the by, as far as your veritable laundry list of "failed" bands go I know you didn't mean it as a compliment but I for one wouldn't mind seeing IFD on that list. To attain true bar-room drunk stupor status you have to, at least for a few moments, been entirely in the lime light. This band most definitely deserves that light. IFD isn't the first band of this nature and I don't see them being the last. But perhaps you have issues with bands such as Ozma. . . they only had like 6 albums and a pretty big fanbase. But hey, what do I know? I'm just a guy who cares about the music who, quite literally, just rolled out of bed to read that inane pile of drivel. However to end this on a truly internet flame worth note. Brain, I feel you've grossly misunderstood me. I'm no scholar of chip-X and nerd-X subgenres. I gave up cataloging such divisions and definitions last decade. I do know a thing or two about lyricism, though, and I don't see LFD's lyrics as particularly poignant, profound, moving, or otherwise insightful. This is not necessarily a fault if such qualities are not their aim. What I will say, however, is that my preference would be that IFD embrace the lyrical traditions of previous bands that straddle the divide between rock star and nerd. Again, that's merely my personal preference. Chiptune or No-tune, the bottom line is these guys still rise above the majority of bands coming out of Chicago. Although the sound isn't grounbreaking, it still counts as great music to be entertained by. If I wanted contemplative songs, IFD probably wouldn't be my first choice - but isn't that what making pop music is all about these days?